BetRally network is known for a lot of things. It is probably best known for its sportsbook. However, the online casino is not inferior in any way. It closely matches the sophistication of the best web casino sites. A live dealer room makes the website even more attractive for players who are seeking a more traditional casino experience. The players who would like to make a withdrawal of their winnings must be prepared to wait. Only €2,000 can be withdrawn in a given week. It is definitely worthwhile to wait for the updates to the promotions section, since some of the appearing deals are quite extraordinary. A welcome bonus greets the visitor. It is a 150% up to €300 deal. 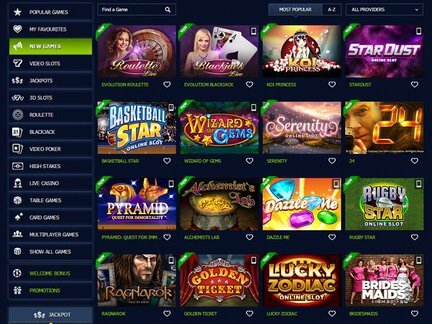 This BetRally Casino Bonus deal allows the player to have a bigger potential impact when playing any one of the four hundred games that can be found on the site. 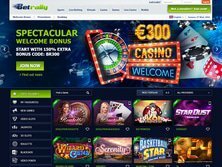 There is a minimum deposit requirement with the deal, mainly €20 (Bonus Code: BR300). Weekly Reload Bonuses are also present on the website. This is known as the Fantastic Three deal. It consists of three reloads, up to €200 each. The minimum deposit requirement is the same as with the welcome offer. Amazingly, the casino has also prepared a special deal just in time for the weekend. At that time, 30% up to €100 cashbacks are unveiled for all users. If that were not enough, a 100% monthly booster bonus makes it possible to boost the bankroll with a a €300 all games bonus. All the standard deposit and withdrawal methods are supported on the website. This would include services such as; Visa, MasterCard, Neteller, Skrill, Bank Transfer, etc. The website is apparently ready to receive traffic from different parts of the world. European and North American visitors can register on the website and enjoy the games without any obstacles. The venue providers support for speakers of the following languages; English, French, Itaian, German, Russian, Swedish and Portugese. However, it is also the case that some restrictions apply. For example, the rollover requirements are higher for individuals who reside in countries like; Philippines, Poland, Romania, Ukraine, Armenia, Cambodia, Croatia, Serbia, Czech Republic, Nepal, Pakistan, Argentina, Brazil, and a number of other places. Furthermore, Polish players are excluded from all the no-deposit offers at the casino. The Evolution varieties of the Blackjack and Roulette games have been very popular among casino guests. The popular game category also features gems like; Koi Princess, Stardust, Serenity, Basketball Star, 24, Ragnarok, Rugby Star, Game of Thrones, Bridesmaids, Dracula, Lucky Zodiac, Gemix, Hook's Heroes, Who Spun It, Alice Adventure, Gladiator, High Society, Sugar Pop, Jekyll and Hyde, Mr. Vegas, The Dark Knight, Jack and the Beanstalk, High Park, The Slotfather, Jackhamer 2, European Roulette, Lucky Clover, Dragons Myth, Lucky Leprechaun, Aztec Idols, Aliens, Rockstar, Haunted House, Happy Birds, Bewitched, Temple of Fortune, and a number of other game titles. The high stakes game category is particularly interesting. Some casino players feel that the waiting withdrawal period is too long. Other players have complained about locked accounts. A number of these complaints have been resolved over time. However, the casino has suffered a bit in ratings. While it is almost never seen as an example of a bad casino (the player ratings place it sightly above average! ), the venue could achieve a better status, if it were not for the complaints. A 24/7 customer support service is currently provided by e-mail. Since Betrally Casino has been licensed in the jurisdiction of Curacao, it enjoys legal protection. It's been operating since 2013. The licensing authority is not as good as some of the other licensing bodies out there. It appears that there is less scrutiny for casinos that come under the Curacao authority. Therefore, the license does nothing to show the credibility of the website. Such credibility must be established on other grounds. I am impressed by the high stakes games on the BetRally Casino website. I am also satisfied with the deals that appear in the promotions section. In my opinion, the welcome bonus & weekly reload bonus offers make the casino very appealing. However, the previously highlighted issues with withdrawals prevent me from giving a full endorsement. I am looking for some improvements in this area. Nevertheless, I think that there is definite potential for this casino.